NeverSeconds: Tia'muei (moose meat) today. Pronounced di·aa·mu·ey. Tia'muei (moose meat) today. Pronounced di·aa·mu·ey. friends came to the rescue. and important in spiritual ceremonies. And here is my lunch. luxury but it is also not traditional. of growing. Ten cents for the potato. Blueberries $1.50. Pieces of hair - No hair again today. a very dry summer all over Turtle Island. vegetables in an oven. Not a traditional way but practical for today. my mother only lets me as a treat once or twice a month. believed to cooperate in the hunt if the hunter was properly prepared. example bones are not to be buried or given to dogs. however fanciful you may find it. he had earned the right to marry. had to kill animals to survive but did not see animals simply as meat. and the prayer ceremony following the successful hunt. Oh, Jagej, what a wonderful post. I especially liked hearing about your hunting traditions. Thanks for the video as well. 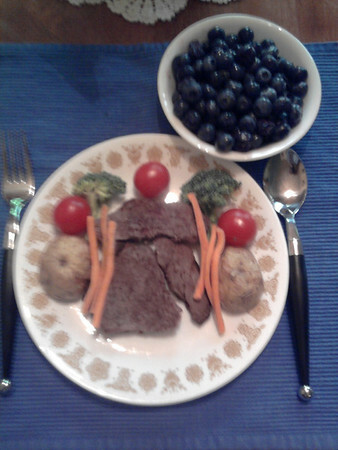 I have tasted Moose when I lived in Alaska. 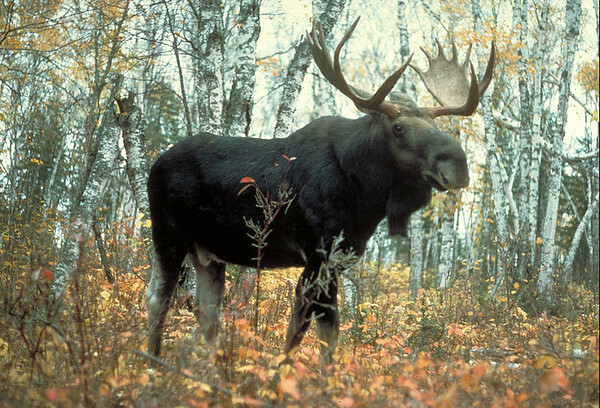 It is very common in Anchorage for Moose to wander through town, especially in the winter when the snow is very deep in the surrounding mountains. They come into town where it is easier move about. They also like to lick the highways, because of the salt used to melt the snow. One has to be very careful driving around Anchorage in winter, so as not to hit a Moose. Thanks again for the wonderful post! Special thanks for the bits about traditional cooking. Considering that salmon has a quite intensive taste, I can understand that there would be little need for herbs to be used when the salmon would be smoked or grilled upon an open fire. But would herbs be used for other meals? The notes about hunting were also very interesting. That connection between hunter and hunted sure is a lot closer in a culture, that depends on all the animals can offer, be it meat, leather, bones... so many things one can do with one moose. In our "civilised" world, nobody thinks twice about what happens to the rest of those animals, which die to feed us. Or to their skin and bones. I sure couldn't live by Your standard, at least not here in Germany, but I do restrict myself to eat no animal I wouldn't be able (or at least ready) to kill and skin myself. If only more people in our modern society had such respect for the land and the animals, our world would be a better place for everyone. This is the way it was meant to be with people living in harmony with the land and having respect for all living things and each other. This is so interesting, thank you "Lobster" and Uncle for sharing. I agree with "The Mrs" and her post from 9.4.12, children in the US are not aware of nutrition and where is the 5th grader who would eat potatoes without fatty toppings and be happy to eat fresh blueberries for dessert AND also know of the antioxident properties?? As long as the USDA calls pizza a vegetable, there isn't much hope for US kids to recognize or eat nutritious foods. Other countries and parents are doing the outstanding education the US should copy!!! Hello Jagej and family, thank you for the excellent posts. I wonder how does venison taste? Thank you so much for sharing your culture and food traditions with us. It's great that these postings have involved your community as well (speaking to an elder, getting moose from a hunter, etc.). Very interesting for me especially because Uncle and cousins belong to the Chickasaw Nation in the U.S., and it's really cool to see the similarities and differences in the traditional Tribal diets.